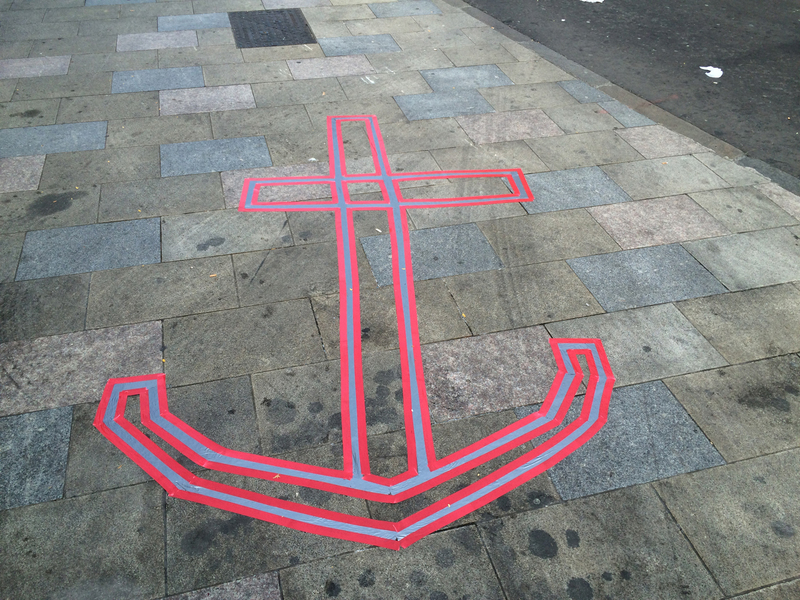 SIGN THE PETITION TO BRING BACK OUR BLOOMIN' ANCHOR! 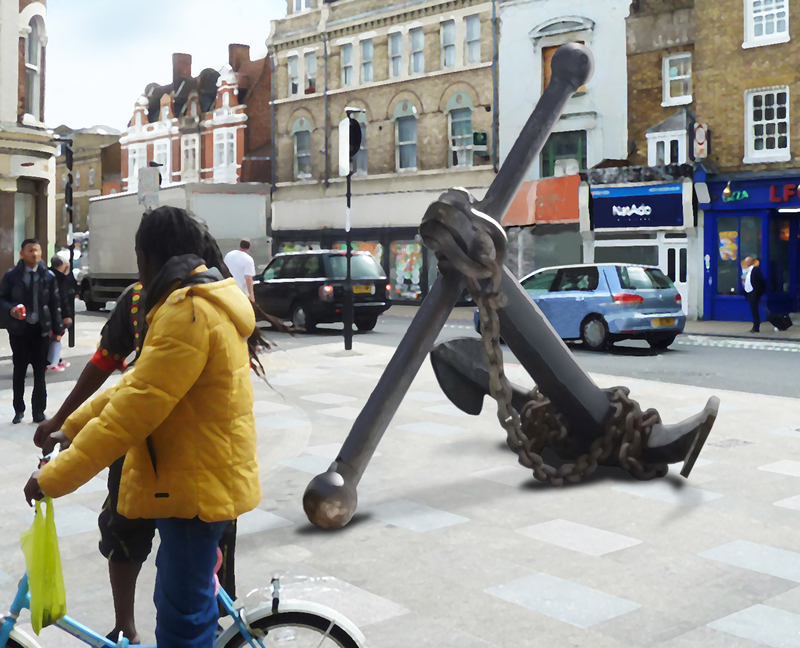 Deptford Is Forever have teamed up with the Deptford Society and 38 Degrees to petition the Mayor of Lewisham to return the anchor to the south end of Deptford High Street. Click anywhere in this box to go to the petition. Comments from petitioners . . .
"The state is happy to preserve castles and stately homes at great expense but working people's history is constantly being eroded, destroyed or taken away"
Our visualisation shows the anchor back in position – plinthless! The owner of Codfather's was happy for us to use his space free of charge. But half way through planning the show, we discovered the Council's Rates Dept would cancel the rate rebate on his empty building if even a small part of it was occupied for just a day. They were completely inflexible to an alternative arrangement and threatened to review the rebate he had received so far. November: Now he is having to pay rates again, the owner has had the shops temporarily fitted out and is renting them out, prior to plans for full renovation. 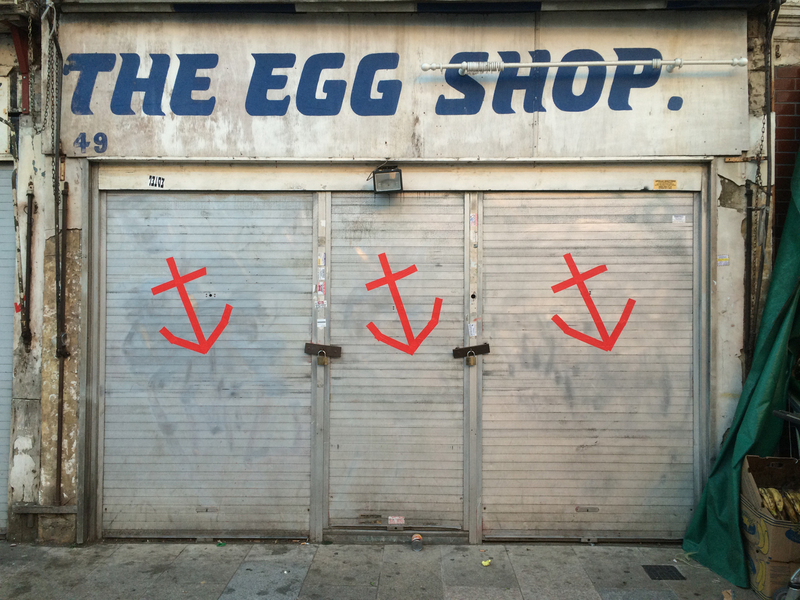 A new barber has taken over the Egg Shop and named it after the anchor! In June we enquired about the old Law Centre, owned by the Council, and empty for many years. 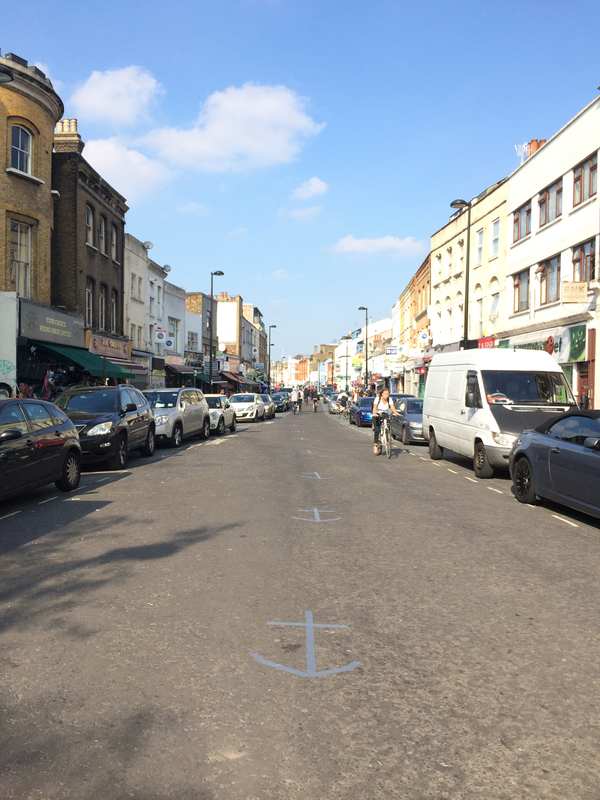 The property has recently been refurbished with money from the Mayor of London's Outer London Fund – the same funding that was used to repave the high street which resulted in the removal of the Anchor. The Council had originally planned to replace the anchor with a coffee stall but diverted funds to this building. It took some detective work to track down who was in charge of it. In July, it was Property Services; they said they were considering tenders from café or restaurant operators and that the premises would be tenanted by the end of September, so it wouldn't be available for use during Deptford X. By September it was obvious the demised Law Centre had not been let and the shop refurbishment was not finished, so we enquired again via Property Services. They told us it was back in the hands of 'Regeneration' who had administered the Outer London Fund budget. Still difficult to track down, Regeneration seemed happy to help if they could. 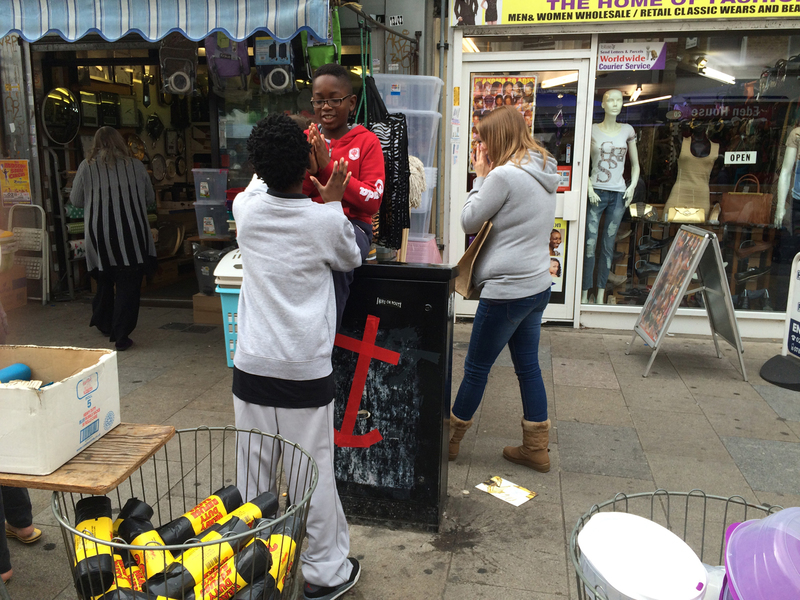 We learned that with match funding from 'Housing', the flats above the shop had been renovated for rent, whilst the shop was intended for 'community use' – which is what it was before, sort of. But its Planning Class was changed last year from 'Financial' to 'Restaurant', so whatever community use there might be, it would have to have a cafe in it, even though a kitchen had not been fitted. Might we have 'meantime use' there until they sorted it out? Unfortunately, Regeneration had to defer to Lewisham's Valuation Office who required a rent of £1500 (for 10 days). In addition, a short term lease would have to be drawn up at a cost of £1000 'to protect both parties'. Generally, meantime use is offered with a simple agreement and sometimes a peppercorn rent. Regeneration apologised, saying "Regrettably the Council do have to take a more commercial approach now to recover all costs, given these austere times". To justify the costs of the lease, we asked that it cover a period of at least six months and be taken on by our associates, The Lenox Project – a flagship Lewisham Council community project that needs office space while it waits to get onsite at Convoys Wharf – and for which the Council already holds funds for this purpose transferred from the GLA since June. It could share the space with Sayes Court Garden CIC, also awaiting receipt of the same funds, and perhaps manage it for other community projects looking for a temporary home. 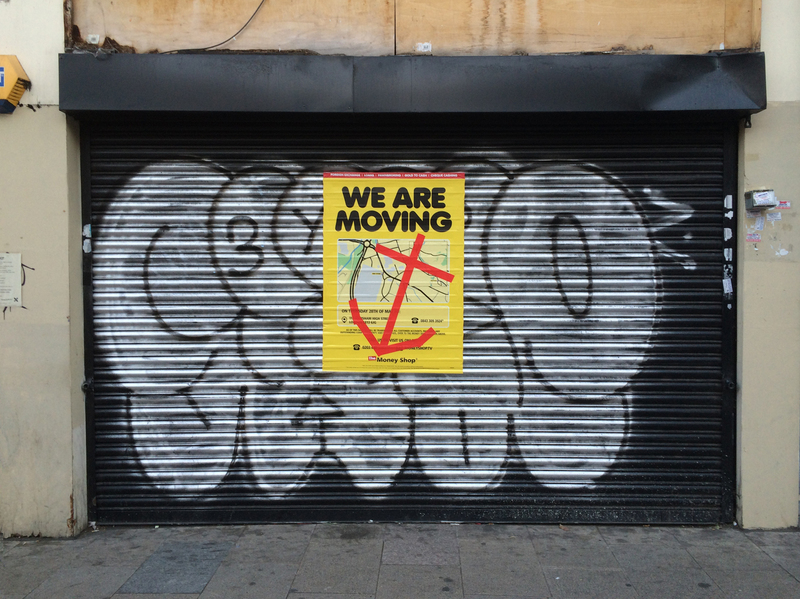 But we were told that the shop could not be let for a longer period because the Council (or Regeneration) were still deciding how the premises would be used in the long term. The whole point about Meanwhile Use is that a shop is not left empty while the landlord finds a longer term tenant. 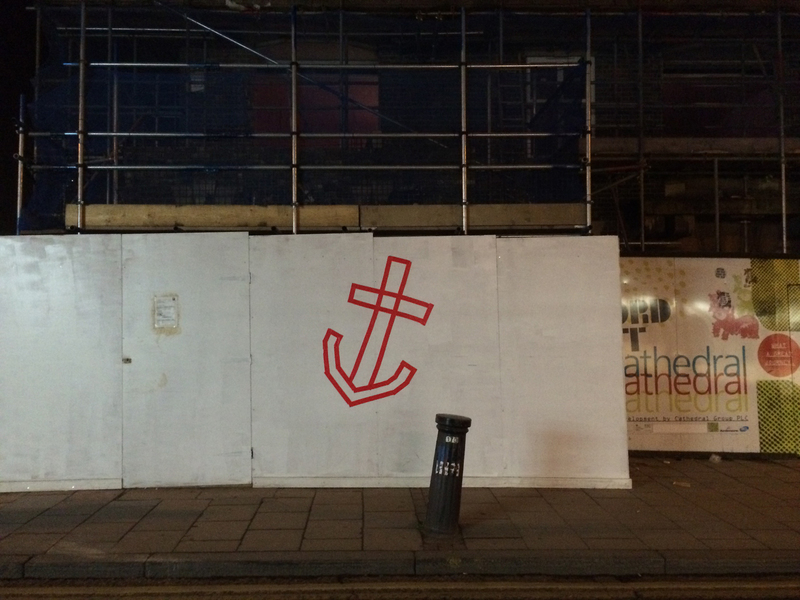 No surprise that a campaign to bring back the anchor could not be accommodated by the people who had removed it in the first place, but disappointing that a short term let could not be provided to The Lenox Project, whose volunteers have worked tirelessly with the Council to save Deptford Royal Dockyard from oblivion and promise to bring the town a prosperity not just based on a property futures market.